a) T. cephalus (photo—G. Harold), b) T. gigas (M. Peterson), c) T. diabolicus sp. nov. (M. Peterson), d) T. fortescuensis sp. nov. (G. Harold), e) T. pseudopsephos sp. nov. —plain form (G. Harold), f) T. pseudopsephos sp. nov.—with charcoal wash on dorsum (G. Harold). Recent work on species complexes of the pebble-mimic dragons of the Australian genus Tympanocryptis has greatly clarified evolutionary relationships among taxa and also indicated that species diversity has been severely underestimated. 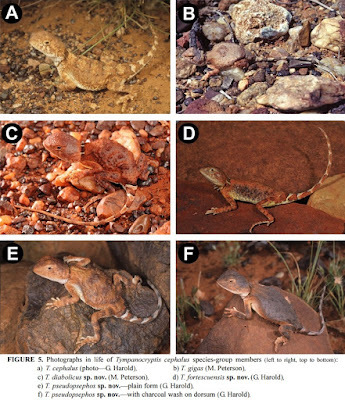 Here we provide a morphological and molecular appraisal of variation in the T. cephalus species-group and find evidence for recognizing five species-level lineages from Western Australia. Four species-level lineages are strongly supported with a combined mitochondrial and nuclear DNA Bayesian analysis (a fifth population from the Gascoyne region lacked tissue samples). Morphologically, we found subtle, yet consistent, differences among the populations in scalation, color and pattern. True T. cephalus Günther is restricted to the coastal Pilbara region and characterized by five dark blotches on the dorsum, keeled ventrals, and other characters. Two other lineages within the Pilbara, from the Hamersley range and Fortescue/northern Pilbara region, differed from T. cephalus senso stricto by possessing a more elongate body and a plain dorsum. Furthermore, the Hamersley lineage differed from the Fortescue lineage by possessing slightly more reddish coloration and feeble keeling on the snout. Although there are few specimens and no tissue samples available for the Gascoyne population, these individuals are larger, have rugose scales on the snout, and possess scattered enlarged tubercles with three large blotches on the dorsum. The name T. cephalus gigas Mitchell is available for this population. The most widespread lineage, and the one best represented in collections and in field guides, occurs throughout central Western Australia. These Goldfield populations are characterized by a protruding snout, narrow rostral, and uniform reddish-brown coloration, often with a dark wash. Based on the genetic and morphological differences, we redescribe T. cephalus, resurrect and elevate T. gigas to a full species and designate a neotype for this taxon, and describe three lineages as new species (T. diabolicus sp. nov., T. fortescuensis sp. nov., T. pseudopsephos sp. nov.). 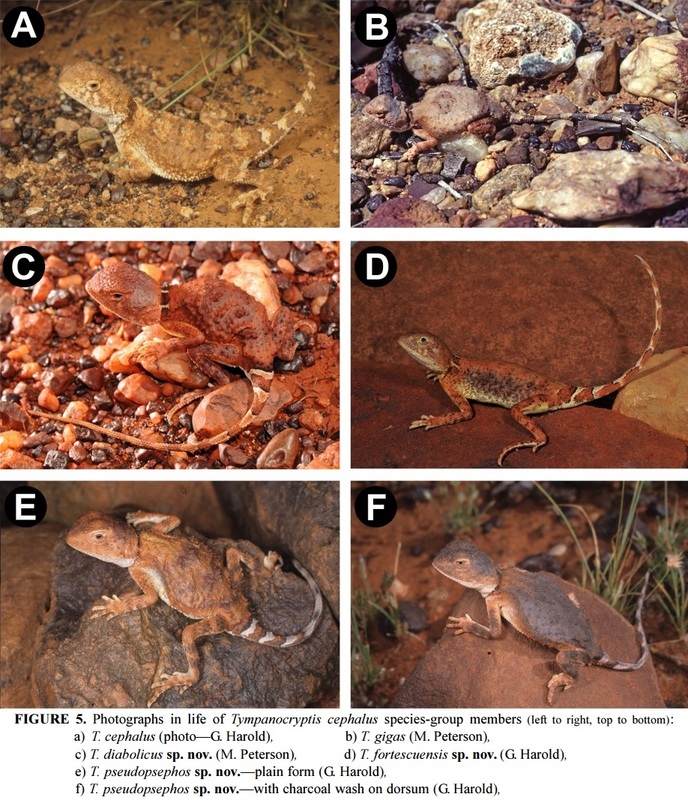 Keywords: Reptilia, agamid lizard, cryptic species, Gascoyne, morphology, mtDNA, nDNA, neotype, Pilbara, taxonomy, Tympanocryptis diabolicus sp. nov., Tympanocryptis fortescuensis sp. nov., Tympanocryptis gigas, Tympanocryptis pseudopsephos sp. nov.